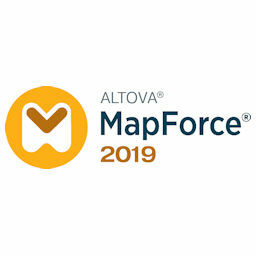 Altova MapForce 2019 Enterprise Edition is a scalable data mapping, integration, and ETL tool. This award-winning application lets you visually map data between any combination of XML, database, EDI, XBRL, flat file, Excel, JSON, and/or Web service, then transforms data instantly or generates royalty-free code for execution of recurrent conversions. Direct file read and write gives MapForce a performance boost by streaming arbitrarily large XML, JSON, CSV, and FLF input and output files. Support for wildcard characters allows you to split data into multiple files or use file names as parameters. Numerous functions come standard (filter, concatenate, sum, etc. ), and you can create and save your own functions or use existing Web services to process data. Once a mapping is defined, you can instantly view and save the output. Additionally, you can automatically generate turnkey applications in XSLT 1.0, XSLT 2.0, XQuery, Java, C++, or C# from your mapping designs. Automate data transformations through the API or ActiveX control. Upload mappings to FlowForce Server for enterprise workflow automation. MapForce supports all major databases, including SQL Server, PostgreSQL, Oracle, MySQL, IBM DB2, Informix, Sybase, and Microsoft Access. EDI support is provided for the most prevalent standards: EDIFACT, X12, HIPAA, HL7, SAP IDoc, and IATA PADIS. The FlexText utility lets you parse structured text files to easily incorporate legacy data in mapping designs. Support for XBRL enables you to comply with financial reporting mandates. Tight integration with Altova StyleVision lets you render your transformation output in attractive HTML, RTF, Word, or PDF reports. MapForce also integrates seamlessly with leading IDEs Visual Studio and Eclipse. Available in 32-bit and 64-bit versions, MapForce is indispensable for anyone facing data integration and Web services implementation challenges.